France; Early 16th Century. Latin Text; Cursive Gothic Script. 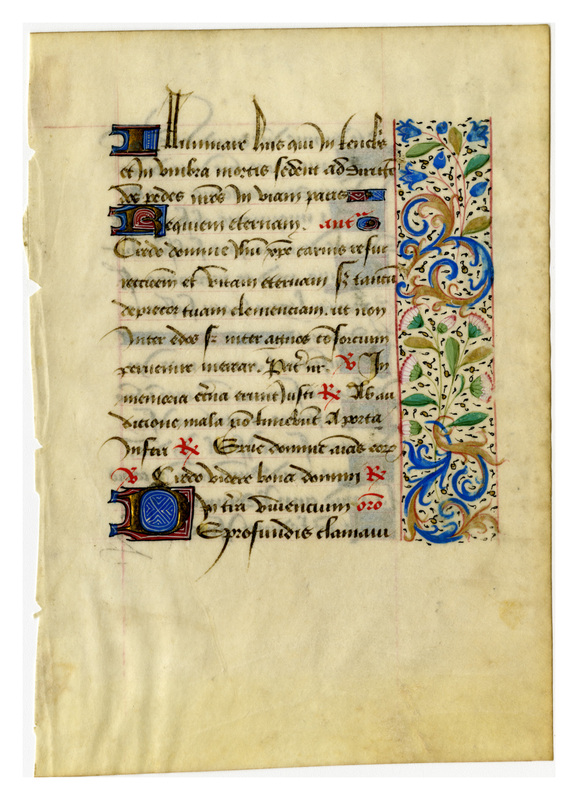 This beautiful manuscript leaf was written and illuminated about the year 1535 A.D. At this late date Books of Hours were also being printed in great numbers by such famous French printers as Vostre, de Colines, and Tory. These were elaborately illustrated and frequenly hand-colored. The cursive gothic script used in this leaf, with its boldly accented letters and flourished initials, borrowed heavily from the decorative chancery or legal hands of the 13th and 14th centuries. It influenced the type face known as civilité, designed by Granjon, and first used in 1559 A.D. This is the latest, or most recent, of the 50 leaves in the Ege portfolio. The cursive script is quite distinctive; notice especially the variety of directions and styles of the ascenders. By contrast the large illuminated initials seem very bulky and old-fashioned. Lesser first letters are filled with yellow. Text: This leaf contains text from the Office for the Dead at Lauds, including Psalms 129. Illuminare his, qui in tenebris et in umbra mortis sedent: ad dirigendos pedes nostros in viam pacis. Requiem aeternam. Ant. Credo domine Jhesu Xriste carnis resurrectionem et vitam eternam [ ] V. In memoria eterna erunt justi. R. Ab auditione mala non tomebunt a porta inferi. R. Erue domine animas eorum. V. Credo videre bona domum. R. [ ] Oratio. Verso Transcription: ad te Domine, Domine exaudi vocem meam. Quia apud te propitiatio est: et propter legem tuam sustinui te Domine. 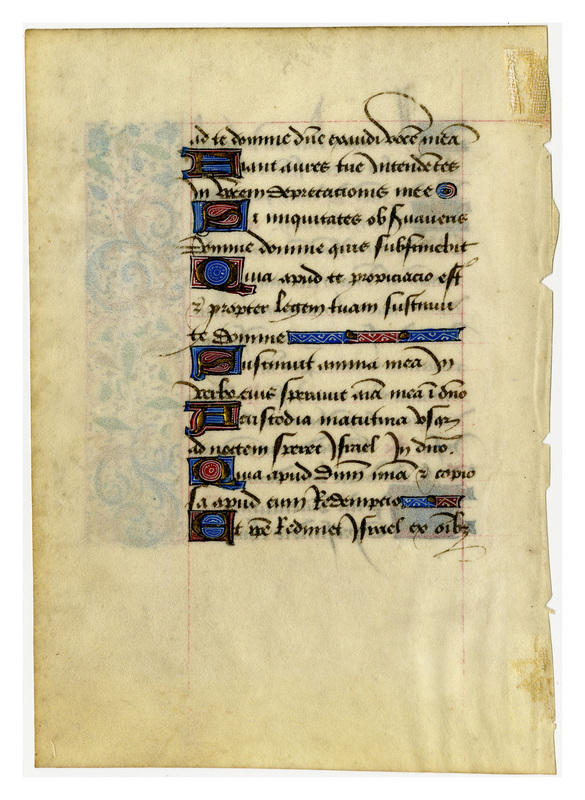 “E0050 Leaf from a Book of Hours (Horæ Beatæ Mariæ Virginis),” Digital Exhibits | Denison University Archives & Special Collections, accessed April 23, 2019, http://exhibits.denisonarchives.org/items/show/70.